Are you thinking about getting a stick vacuum? In a world full of choices, there are tons of everything to choose from, and that includes cleaning appliances like vacuums. Based on our research, Bissell’s PowerEdge Pet Hard Floor Vacuum Cleaner is an excellent stick vacuum. It’s both reasonably priced and very well-liked by buyers on Amazon. Spin power, motor power, and warranty are important factors when choosing a stick vacuum. Different vacuums have different features, and the story is no different when it comes to stick vacs and handheld vacuums. The only way to make the choice any easier is to know what you’re doing, what you’re buying and why. So, let’s take a closer look at stick vacuums and why you might need one for your household. What Is A Stick Vacuum? No matter who makes them: Dirt Devil, Hoover, Dyson, Black & Decker, Eufy – the list is endless, – the idea of a power stick vacuum is the same across the board. A stick vacuum is a type of upright vacuum, but a more lightweight and less powerful version. Unlike traditional vacuums, a stick vacuum doesn’t have a bag to trap debris. Instead, it uses a dirt cup or canister that has to be emptied between uses. That’s because stick vacuums feature a small motor and canister with a handheld stick or shaft-like handle and body. They’re designed to be compact and portable; a cordless stick vacuum can be carried around easily and is relatively simple to use. Some even convert to a handheld vacuum, by removing the lightweight stick handle or powered cleaning head, making them ideal for more than just floor and carpet cleaning. In fact, stick vacuums work best for hard-to-reach places like beneath or around furniture, due to their compact size. Designed for convenience and ease of use, there are two main types of stick vacuums to choose from: corded and cordless. What Is A Stick Vacuum Best for? Stick vacuums were traditionally thought to only be good for hardwood floors and carpets with a very low pile. However, today, there exists a wide range of stick vacuums to choose from and some of them are powerful enough to be used as your main vacuum. If you have a small house with a minimal amount of carpeting, a stick vacuum might be all you need to clean the whole home. This type of vacuum is particularly suited for spot cleaning and getting to places that a larger, bulkier vacuum can’t reach. Being lightweight makes it more portable and easier to use for quick, immediate jobs, like picking up spilled flour in the kitchen before dinner. It’s perfect for light cleaning and maintenance. The cordless option allows for greater portability. You may even take it with you on-the-go, as you can choose between a rechargeable vacuum or one with batteries that can be replaced. Based on their design and function, the majority of stick vacuums are ideal for houses with bare, hard floors, light carpeted areas and area rugs. Vacs with a brush roll can be used on more heavily carpeted areas, however, the deeper the pile, the less ideal it becomes to use a stick vacuum. Like anything else on the market, stick vacuums come at a range of prices and features. The more powerful the features, the more expensive the vacuum. To choose the best one for you, you need to know what you need a stick vacuum for, and what features you need yours to have. For starters, you will have to choose between a corded or a cordless vacuum. Cordless – This uses batteries that are replaceable, or it docks onto a charger that you keep near an electrical outlet. They allow for ultimate portability, as they are untethered, giving you the freedom to virtually clean everywhere. But that leaves your battery power limited per use, so if you’re cleaning a big house, it won’t last very long as your main cleaning tool – anywhere from 15-40 minutes. Corded – This needs an electrical outlet, giving you an endless power-supply to clean as much as you want to. The cord, however, does mean you’re tethered to the radius of an available outlet. For greater range, you’ll need to buy a vac with a longer cord, and cord length varies with price. But keep in mind, most consumers find that corded stick vacuums have greater durability than cordless stick vacuums. In between these two main options, there is an endless variety to the type of stick vac you can get. You can have a cordless stick vacuum with lithium-ion batteries like the Dyson V8 for everything in your house or the Hoover Linx Stick for just the floors. Or if you want maximum pick-up and power, you could try a Dirt Devil Power Air corded bagless vacuum, a cyclonic stick vacuum cleaner. Suction Power: Vacuums are cleaning appliances, so the most important thing to do when buying one is to make sure it has the power to do the job. Your vacuum should have enough suction power to conveniently pick up a variety of messes, including pet hair and chunks of dirt. Size/Weight: All stick vacuums are made to be lightweight and far more portable than their traditional counterparts. Yet, some are smaller and more compact than others. Their easy-to-handle size and weight make them ideal for people who struggle with heavier machinery, like the elderly or disabled. Brush roll with On/Off Options: First of all, a brush roll is necessary for properly cleaning carpet and rugs. But with a stick vac or hand vac, having no brush roll ensures that the debris doesn’t fly around when cleaning hard floors and other smooth surfaces. A good stick vacuum will come with the option to use a brush roll when necessary. Ability to Get Edges and Corners: Designed for convenience in cleaning hard-to-reach places, a decent stick vac should allow you to vacuum crevices and around objects – whether by use of an attachment or the compact/convertible design of the vacuum. Hand-Vacuum Convertibility: On some stick vacuums, the lightweight stick or powered cleaning head can be removed to convert from a stick vacuum to a handheld vacuum. Handheld vacuums are ideal for cleaning non-floor surfaces, like upholstery. Nozzle Size: Different stick vacs have different nozzle sizes. A wider nozzle will allow you to cover a greater surface area, making cleaning faster. A narrower nozzle gives you greater maneuverability between tight spaces, for precision cleaning. Ease of Maintenance: As bagless vacuums, stick vacs utilize a canister that needs to be emptied. Some stick vacuums are easier to empty, while others are a lot messier. If you have allergies, this may not be ideal. Storage: Designed to be easy to store, some stick vacuums come with wall mounts to save floor space. Some come with docking stations that keep your vac charged, standing on the floor or hanging on a wall. There are also ones that have fold-down or collapsible handles for compact storage in shelves and cupboards. 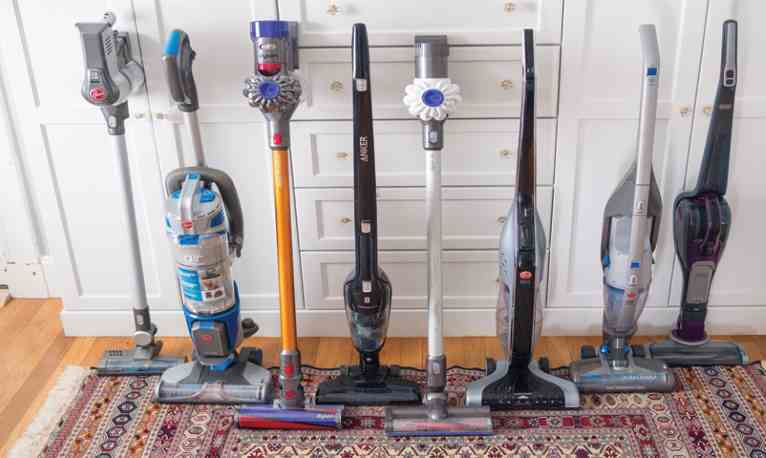 When deciding to buy a good stick vacuum, you’ll need to take all of these features into consideration to make sure you buy the right one for your needs. But be sure to ask yourself what type of cleaning you require for the type of floors you have, as this question ultimately determines what type of vacuum you need. A stick vacuum is best as the main cleaning tool for small houses with hard floors and low-pile carpet. But it is a useful appliance to have in any cleaning arsenal, especially for fast clean-ups, getting to tight spaces and cleaning other, non-floor surfaces. It’s lightweight and easy to carry and use, plus, some are even portable enough to take anywhere. There are so many choices on the market that you can’t really go wrong if you take time to read some product reviews before you buy your own pro bagless stick. We love Bissell’s PowerEdge Pet Hard Floor Vacuum Cleaner but other top sellers on the list include the Shark Navigator Freestyle Cordless stick vacuum, Eufy Homevac Lightweight Cordless Upright-Style Vacuum Cleaner with a rechargeable lithium-ion battery, and the Electrolux Ergorapido Lithium-Ion 2-1 Stick and Handheld Vacuum.